You have the option to use EchoSpan's standard report templates and/or create and customize your own. 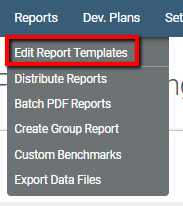 If you would like to create a custom template to use, from the drop-down menu, select Reports >> Edit Report Templates. Enter a title for your report template.